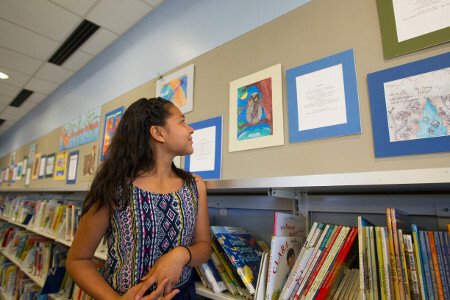 The Pima County Department of Natural Resources, Parks and Recreation and the Pima County Regional Flood Control District will recognize the winning youth poets and artists of this year’s Living River of Words Youth Art and Poetry Contest (LROW) during an April 7 ceremony at Wheeler Taft Abbett Sr. Library, 7800 N. Schisler Dr. The festivities will run from 9 a.m. to noon. LROW participants submitted more than 800 entries, from which 56 were selected for special recognition. The award-winning youth poets and artists represent 15 local schools. Their work will be displayed at the Wheeler Taft Abbett Library April 7– May 13 and will travel to several public venues throughout the year. The April 7 ceremony will celebrate the return of the endangered Gila topminnow to the Santa Cruz River. Organizers also will recognize the Living River of Words Teachers of the Year: Valerie Selden from Ochoa Elementary School and Marea Jenness from Tucson High Magnet School. Living River of Words introduces children ages 5 to 19 to watersheds and wetland habitats through science investigations and the practice of poetry and visual arts. Students and teachers get out of the classroom and spend a morning in the Lower Santa Cruz River conducting water quality tests, observing wildlife and plant interactions, and taking time for reflection and journaling. Back in the classroom and along the river, students work with local artists to take what they have learned and create poetry or art entries for the contest.This year’s Living River Celebration will include fun family activities and separate award ceremonies - one for students in kindergarten to third grade and another for fourth through twelfth graders. Living River Celebration – Children’s Corner, 9 a.m.-noon.